How to Track & Send message to iPhone/iPad from iCloud? Considering you have upgraded your iPhone or iPad to iOS5 and enabled iCloud for your iOS5 device, go to Settings > iCloud and Switch ON “Find my iPad” or “Find my iPhone” option depending on your device type. Now go to icloud.com and log in with your Apple Id. This Apple id should be same as configured on your iOS5 device. Now Click on “Find my Iphone” option on the home screen of iCloud. 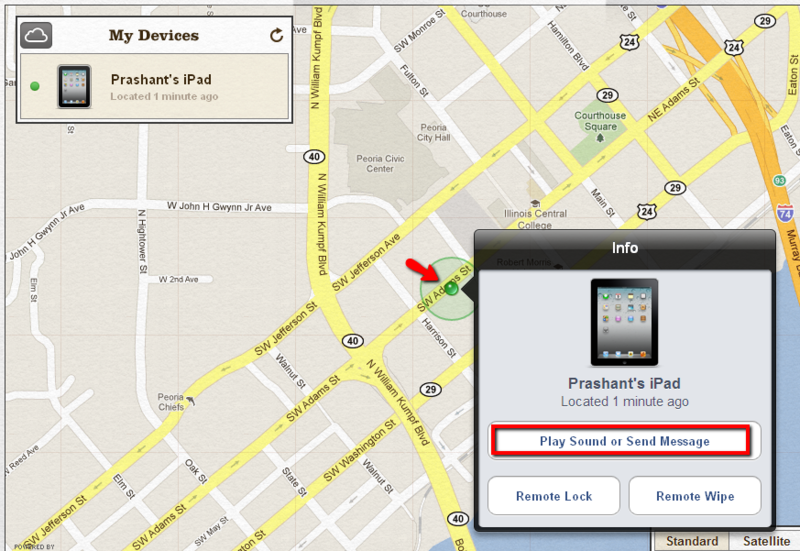 As soon you click it, iCloud will start tracking you iOS5 device and will soon show its location on Google maps. 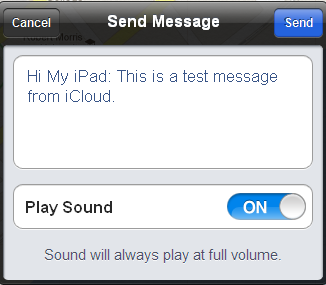 Once you iPad/iPhone is located, you can click on ‘Send Message’ button and then compose a brief message and hit ‘Send’. By default message is sent with a sound which can be disabled while sending the message. 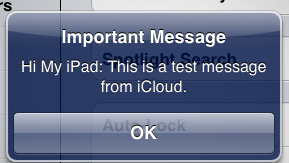 Message sent from iCloud in above step will be sent a notification to the iOS device and will appear on device screen. It will also continue to play the sound until user clicks ‘OK’ on the message. User can also lock the iOS device from iCloud. If any passcode is set for the device, iOS device will have to enter the password to access the device. User can also wipe out all the data on the device in case of any theft.